By declaring an "executive action", the president tries to bypass Congress to get $5.7bn Democrats have denied him for his wall. Donald Trump will sign a security funding bill to avert another government shutdown but will also declare a national emergency over the border wall, says the White House. By declaring an "executive action", the Republican president is attempting to bypass Congress to get $5.7bn that Democrats in the House of Representatives have denied him for his wall along the southern border with Mexico. So far, in stopping him from getting that money, politicians have blocked Mr Trump from implementing one of his key 2016 campaign pledges. Senior Democrats warned the president that declaring a national emergency over the border wall would be a "lawless act" and a "gross abuse" of power. 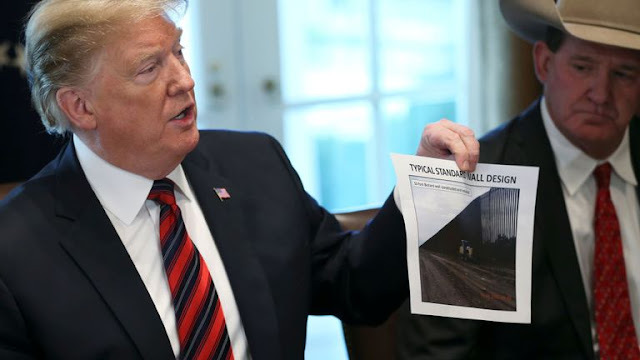 The border bill, providing more than $300bn for homeland security, does not contain the money Mr Trump demanded for the wall but does contain cash for other border security measures. The bill would provide $1.37bn to help build 55 miles of new physical barriers on the border - the same amount of cash as last year. Congress passed the bill on Thursday and it now has to be signed by the president to become law. But Democrat opponents appear set to launch a court challenge to Mr Trump's move on constitutional grounds. In a joint statement, Senate Democratic leader Chuck Schumer and Speaker of the House Nancy Pelosi criticised Mr Trump's announcement, insisting the situation on the border was not an emergency. "Declaring a national emergency would be a lawless act, a gross abuse of the power of the presidency and a desperate attempt to distract from the fact that President Trump broke his core promise to have Mexico pay for his wall," they said. "It is yet another demonstration of President Trump's naked contempt for the rule of law. "This is not an emergency, and the president's fear-mongering doesn't make it one." Asked by reporters whether she would file a legal challenge to the emergency declaration, Democrat Ms Pelosi said: "I may, that's an option." She said the president, who claims he wants the wall to keep out Mexican criminals, would set a precedent with his emergency declaration that should be met with great unease and dismay by Republicans. The White House has identified $2.7bn in funds previously provided by Congress that could be redirected to barrier funding as part of an emergency, according to a Reuters source. And White House lawyers had looked at the figures and believed they would withstand a legal challenge, said the source. The bipartisan legislation would provide more than $300bn to fund Homeland Security and a range of other federal agencies until 30 September, the end of the current fiscal year. Funding is due to expire on Friday and if more money is not confirmed it would trigger another partial federal shutdown on Saturday morning.